Ignore The Plywood: Tutti’s Is Open! Tutti’s is one of those wonderful Westport restaurants: excellent, intimate, yet so small it’s sometimes off our where-do-we-go-tonight radar? That’s tough enough, in these cutthroat culinary days. But now the Saugatuck jewel faces another challenge. Last week, a driver caused severe damage to the front of the building. No one was hurt. But a large piece of plywood still replaces a window. The insurance company is taking its time processing the claim. It won’t allow the building to be repaired. Tutti’s parking lot was filled during the Slice of Saugatuck. The restaurant is an important part of the neighborhood. Many folks think the restaurant is closed. But if business doesn’t pick up, this gem — a family-owned favorite since 2002 — will suffer severely. 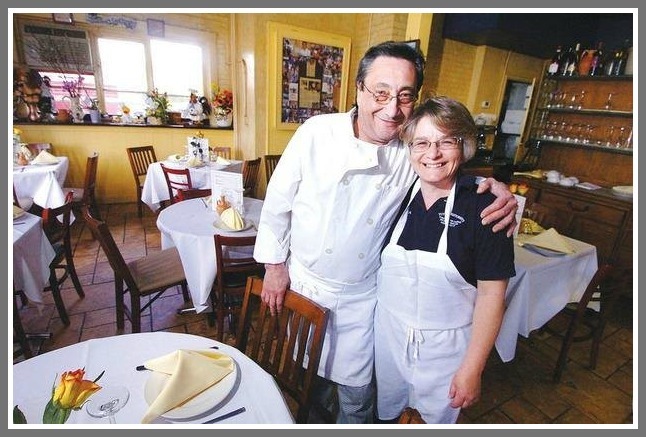 Owners Pasquale and Maria Funicello — and their family — keep Tutti’s going. So, “06880” readers, here’s a plea. If you’re a regular: Head back. 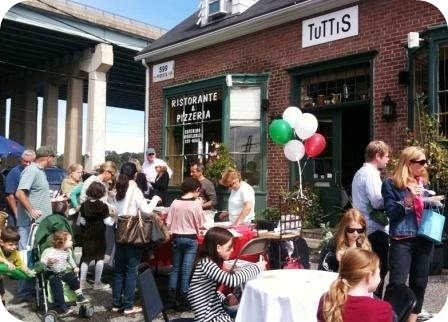 If you’ve never been to Tutti’s, head over to 599 Riverside Avenue. You won’t be disappointed. Need any more encouragement? Click here for the menu! 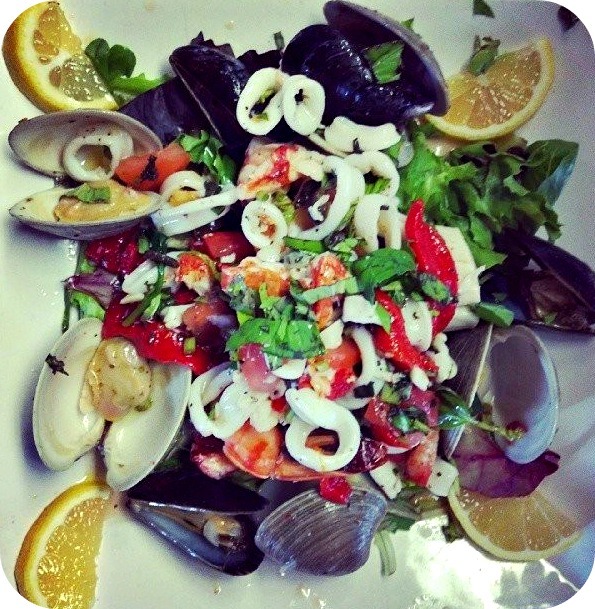 One of the many delicious dishes at Tutti’s. This entry was posted in People, Restaurants, Saugatuck and tagged Pasquale and Maria Funicello, Tutti's restaurant. Bookmark the permalink. I was wondering what happened! Yes – this is one of those wonderful mom and pop restaurants – one of the last few – so please go and eat there because the food, service, atmosphere – everything – is EXCELLENT! We love it there – so please everyone help out Pasquale and Maria – and head back to Tutti’s! Thanks Dan. The Chamber put in its email the same thing. Come Mangia, Tuttis is open. Just stopped in last night after a while of not being there. Food as amazing as ever! And Maria is such a doll. We were surprised to see the plywood but they’ve covered it with curtains on the inside so the place is just as cozy as ever. So go if you’ve never been and go back if you haven’t been for a while. Maria will appreciate it. Or maybe an artistic type could volunteer to paint “Open!” and make it look really nice — not like graffiti. Agree with the others…great place and extremely nice family. Plus, they do takeout. Thank you for highlighting this. I did think it was closed, but will head over to show our support. Tutti’s is our all-time favorite restaurant! Will go there as soon as we can to support Maria and her family. Hope other Westporters do so as well. One of the last times we were there, Stew Leonard was at the next table. Let’s get everyone behind them! The family should not suffer and loss because of a driver who was out of control. Too precious a resource to be in trouble! Hat’s off to our wonderful insurance industry! Of course it takes weeks and week to determine that this is an honest claim. After all, restaurant owners routinely arrange to have accomplices drive cars through their front windows so they can replace their old glass with new, don’t they? Tutti’s is part of a vanishing breed in Westport- far too few are left…good restaurants that are reasonably priced, comfortable, not “farm to fork/on trend” …and friendly. The warmth and “old school” charm of the Saugatuck gem is instantly obvious.. If you are really “old” school…who can forget the Funicello’s distant cousin- Annette? Sing out loud: M-I-C, …K-E-Y…,. (pause) M-O-U-S-E!